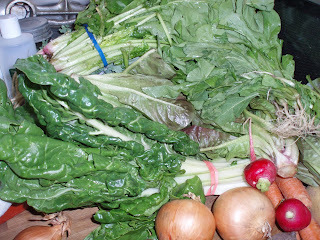 We’re doing the CSA again, this year. I love walking to the pickup point, and selecting my choices. We have a small share – and our CSA often handles that by listing, say, four kinds of greens and telling us to choose two. Or we have a choice between an acorn squash – in that season – and a buttercup squash, while the full share people get one of each. 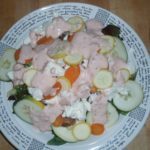 Even with the small share, we have had lots of salad greens – and I’m eating salads for lunch every day, as well as side salads with some dinners. 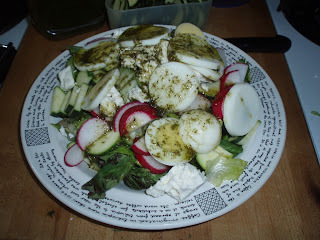 I wrote about this before in this post about salads. 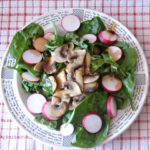 I love mixing two kinds of lettuce, and arugula, and spinach, with chopped fresh radishes and peas to make a Spring salad. And I’m not about to pour a bottled commercial salad dressing over this glorious green freshness. Now – dressing a salad with the classic French oil and vinegar is an art. You take your wooden salad bowl, and rub it with a cut clove of garlic. Then you carefully tear your freshly washed greens into it, adding some fresh herbs, perhaps a scallion, and toss the greens with your salad tongs or serving spoon and fork set. Carefully pour a dribble of fruity green olive oil over the greens and toss. Then, add a pinch of salt – toss again. 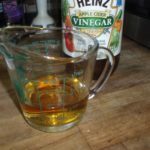 Then just a little good wine vinegar – about a third as much vinegar as oil, is the most traditional ratio, but you can vary it to your own taste – and toss that. Now you have your perfectly dressed salad – and, I hope, the applause of your guests. Am I doing this on a weekday evening when I’m trying to get dinner on the table quickly? Well, no. Am I doing this to prepare a lunch salad I’m assembling in a plastic covered bowl, to go eat in a park, between clients? Be real! So I compromise. 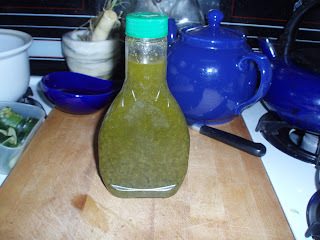 I make my own dressing – and yes, I put it in a bottle – but I control the ingredients. A basic dressing is still as I described. Two thirds oil, one third vinegar. That can be varied infinitely, though. Olive oil, always, in my house… Usually (but not invariably) a good sharp wine vinegar. In a pinch, I may just use that, or sprinkle in a pinch of some dried herbs – mix that first with the vinegar, it won’t blend well with the oil. I put it in an old shaker bottle from (I confess) a commercial dressing – I find the shaker bottle helps prevent it from separating in that moment between shaking and pouring. But right now, my CSA is also giving me bunches of beautiful fresh herbs. So I don’t have to compromise – I can make a perfect fresh dressing, ready to pour on every salad I eat. 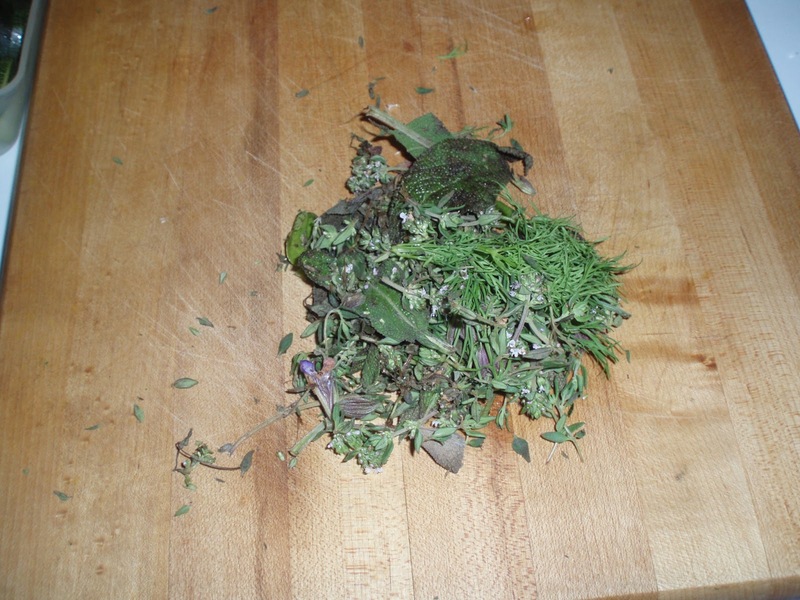 Chop herbs coarsely. Place in blender jar with vinegar, and salt, if using. Blend until finely chopped. 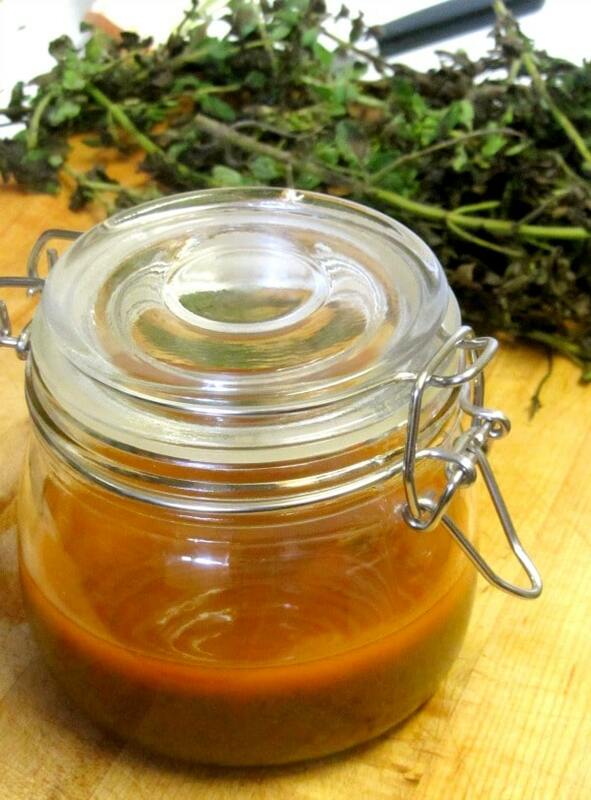 Mix vinegar herb liquid with the oil, and blend. 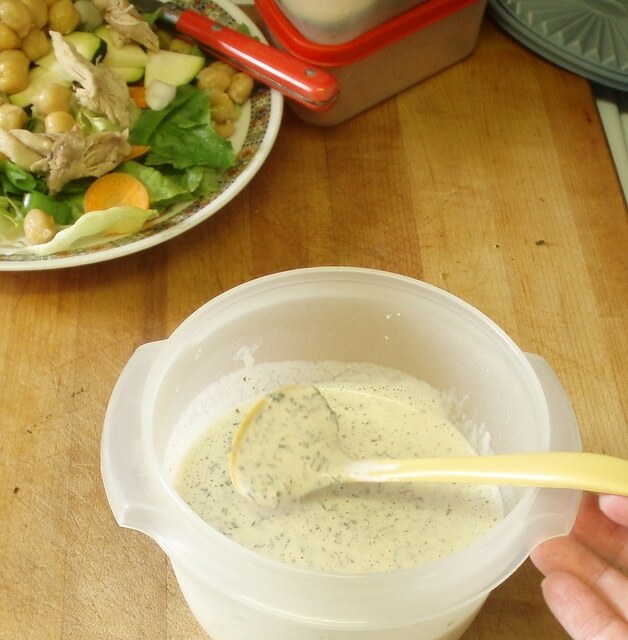 In Search Of – Creamy Salad Dressing! Way cool! I'm so glad I found this blog! 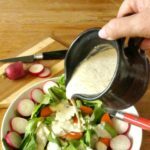 I've been wanting to start making our salad dressing from scratch, do you have more recipes? Second, I have frozen basil in ice cube form from last year. Can I mix this with vinegar and oil, or do I need to stick with fresh or dried herbs? The frozen basil should work just fine. If you froze it in water, you may want to let it thaw and squeeze out as much water as you can, before pureeing it with the vinegar. If you froze it in oil, as I sometimes do, you might want to puree it in the additional olive oil, and then mix that with the vinegar - the opposite of what I suggest in the original post.